3 bedroom home located just 2 minutes walk from Russell town. Ever wondered what it is like to live in one of those houses on Russell Beach? This private home has been in the family for 3 generations. Located on the Russell Waterfront, just 200 metres from the Strand, less than one minute from the boat ramp and three minutes’ casual stroll to local restaurants, the wharf & central Russell Shop’s. 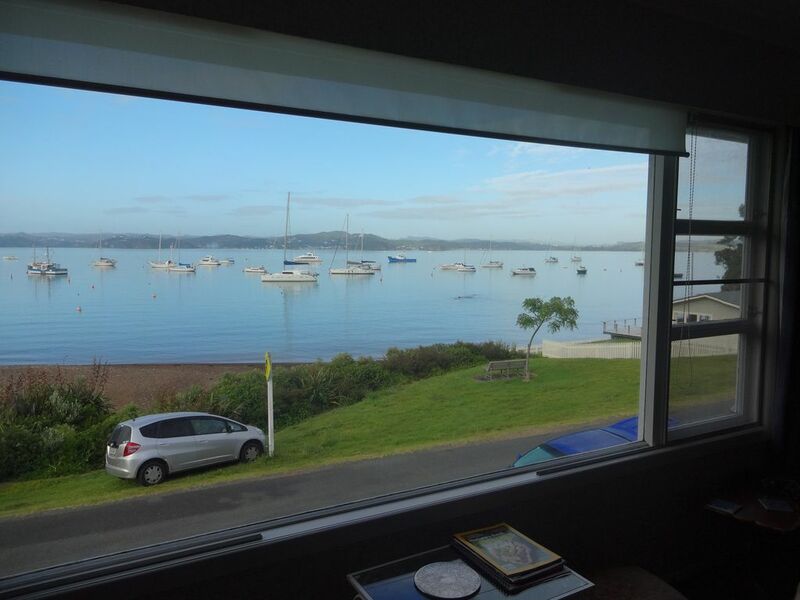 The view from your lounge chair is a world class panoramic moving picture of Kororareka (Russell) waterfront, the wharf, boat ramp, yachts at moorings, departing ferries, private boats out to catch the daily quota, and across the bay to Paihia and Waitangi. Mature dogs (less than 30kgs) are welcome. Subject to our pets policy, please walk on a lead. Fujitsu heat pump - air cooler. Oil heaters are available for winter. Kitchen is equipped as you would expect for a family home, there is an electric hob and oven. We are on tank water so no dishwasher. Smart-TV, with Freeview on demand, and a DVD player. Swimming plus fishing off the beach. A 3 bedroom family bach in a perfect location close to Russell shops and with amazing views. A 3 bedroom house in a perfect location - right near the main Russell boat ramp and just an easy 5 minute walk to the main Russell shops. One couldn't get a better view from the main living room and main bedroom windows overlooking the beautiful bay and boats anchored. Just a shame there is no outside deck at the front to take in the views and enjoy the balmy evenings in summer. Perhaps one of the levels of lawn could be turned into a nice sitting area. Our queen sized bed was very comfortable with lovely crisp white sheets and towels. House nicely clean and tidy. The shower was rather lacking in pressure, but good with helping to conserve the tank water! The kitchen was well equipped. The furniture was quaintly old fashioned but very comfortable. We enjoyed viewing the family photos and being able to learn about the history of the house and family. An easily accessible garage on the lower level where we could store our kayak and easily carry it across the road and down to the beach. The host Kelli was very friendly and helpful with directions etc. We would be happy to stay here again. The location of this bach is perfect. Short walk to good coffee and food. Beautiful sunsets viewed from the large lounge windows. Has everything you need at the bach. Did most of our cooking on the the large BBQ outside. Great place to bring your dog. It has good fences and gates to keep your furry friend safe. We had a great time here, thank you.